I am extremely excited for the U.S. 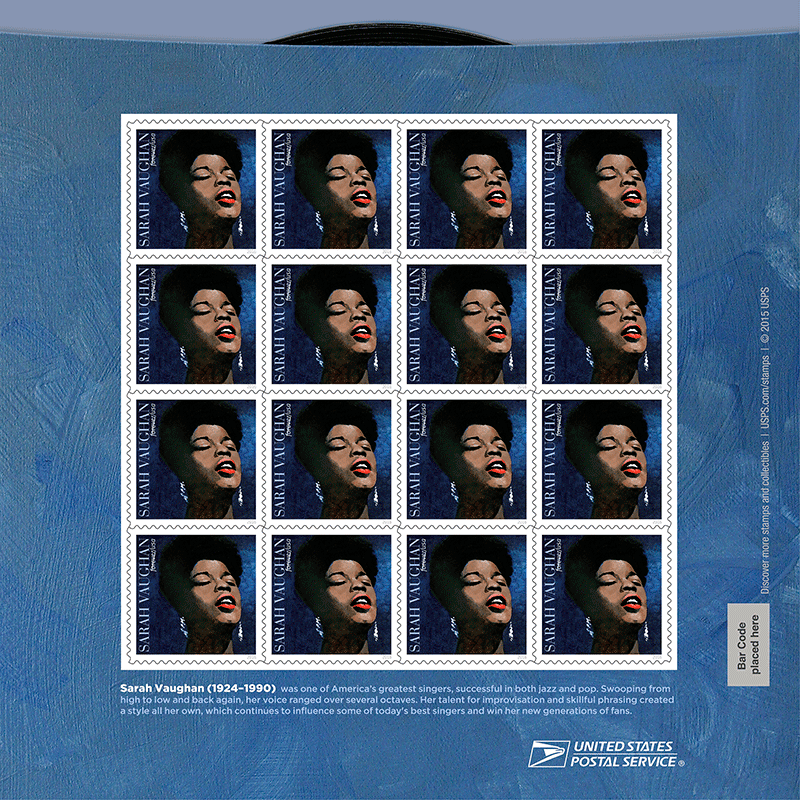 Postal Service stamp releases this year. There are some great stamps coming! 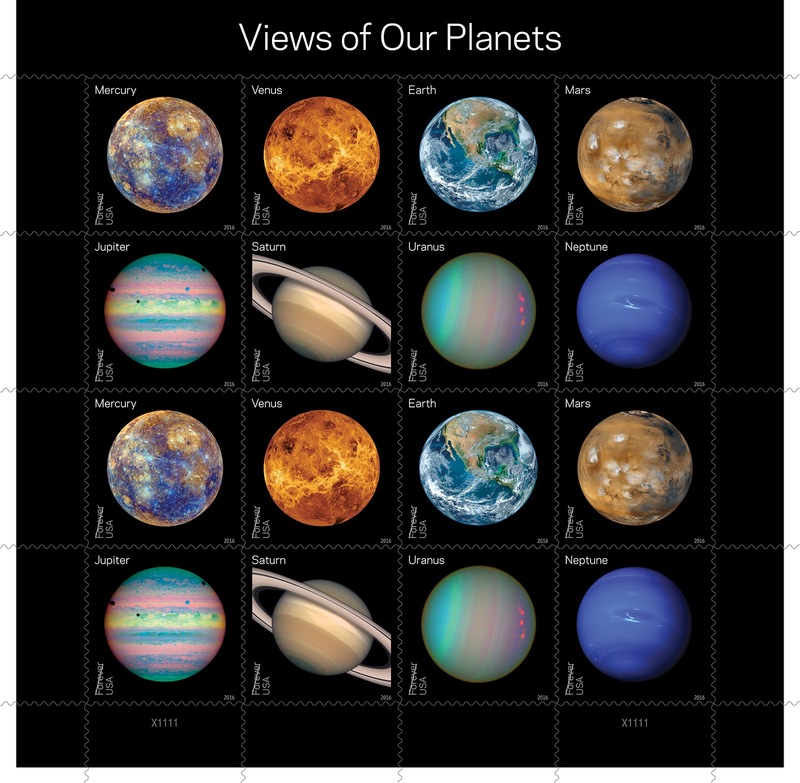 Space and planets are a major theme, and there are three planetary releases: Views of our Planets, Pluto--Explored!, and The Moon global forever stamp. This article has more info about all three issues. I think the "Views of our Planets" stamps look particularly gorgeous and I can't wait to get my hands on them. Word on the street is that these will be released at the World Stamp Show in NYC somewhere between late May and early June. Continuing the "space" theme, shown above are the stamps that so many of us are really geeking out about: Star Trek stamps! These stamps commemorate the 50th anniversary of the iconic TV show's premiere, and though I don't know the exact release date, it looks to be somewhere in the second half of the year. I'll have to get my eyes on them in person before I pass judgment, but I admit I have reservations about the design. What's with the grainy look? Oh well. I shouldn't quibble about Star Trek stamps, because it is a very fabulous idea. I'm also a big fan of all the stamp releases that feature musicians... but I'm over the moon (ha! Space pun!) 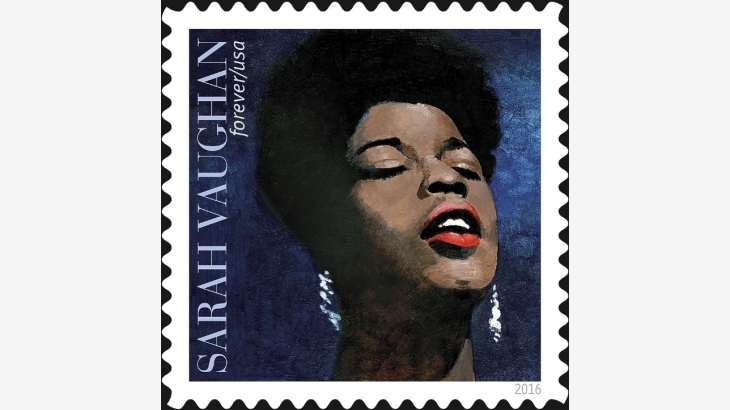 about the upcoming Sarah Vaughan stamps. Jazz singers are always close to my heart - I sing a lot of jazz myself, and there's so much to learn from any singer's individual style - but "Sassy" is in a class by herself. Sarah Vaughan is not only one of my favorite jazz singers, but she's the one who made me first fall in love with jazz vocals back when I was in high school (and, at the time, singing only classical music). Her style, technique, and artistry are unparalleled, and I can't wait to buy up a TON of these gorgeous stamps to use on my letters. They'll be released on Mach 29, so we don't have too much longer to wait. Design thoughts: again, I'll wait to hold the inked paper in my hands, but this design idea gets a thumbs up from me. I think the artwork is lovely, and I appreciate the decision to use an illustration (a painting?) instead of a photograph. This really captures the mood of her style and her immersion in the music. I love that her eyes are closed, though I know not everyone will agree on that point. There are more great stamps than I could even share here, and I highly recommend a look at the 2016 stamp release preview to see them all... but I'll just mention that the Pets and Jack-O-Lanterns also look very promising. And I haven't forgotten about my promise to do a blog post about my new stamp organization system, which is working quite well so far. I have an unexpected snow day today (blizzard in Boston! the first flakes just started falling here in NH at about 11am) so maybe I'll manage some photos and some work on that. But for now, enjoy the stamp preview! 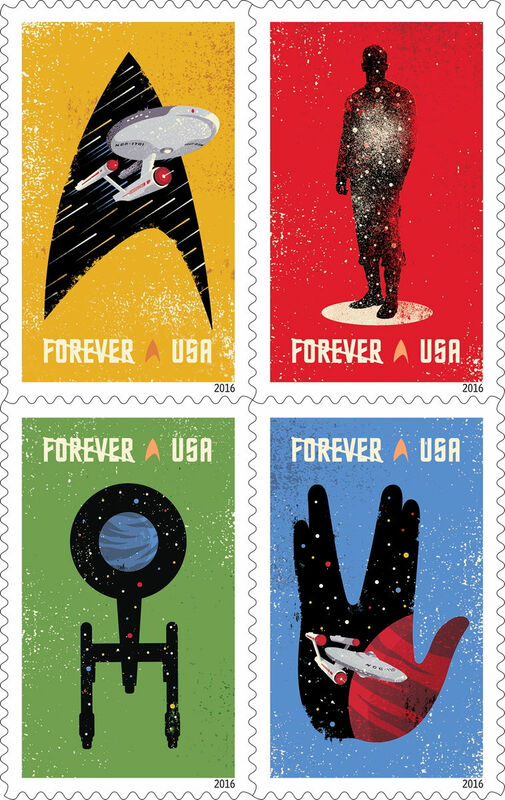 I wasn't crazy about the Trek stamps at first glance, but they've definitely grown on me -- particularly the use of the logo between "Forever" and "USA". Domestic mail is fine, but we need some global Trek stamps too! Chris, I hadn't even noticed the Star Trek logo there - cool! Wow, I love the planet ones. I got the Chinese New Years stamps and the paper heart ones today. Both are pretty. I can't wait for the planets and star trek stamps. YUMMY! 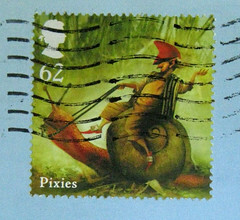 I haven't been able to get any global stamps recently, not even on-line! I've been buying $1 ones and adding the additional postage needed. Not a problem but I was liking those round ones a lot. Thanks for posting these stamps. Get's my anticipatory juices flowing. Mim, I'm with you on the global stamps - I cannot for the life of me figure out why the US postal service can't stock enough of 'em online. I guess they want to run out. You can get them in large quantities / press sheets, but does "without die cuts" mean they're not perforated to be single stamps? Anyway, you can get them with a markup sometimes on Amazon or eBay, but who wants that? Silly. "They'll be released on Mach 29" LOL!! Nice space pun Ilona. I'm anxious the see the global Moon stamps myself. I don't understand why they didn't have them ready for three of the biggest mailing events of the year - Month of Letters, Incowrimo, and Valentine's Day. Sheesh! I hear you, Rusty, but I certainly couldn't understand the workings (or the release schedules) of the Postal Service. I know they understand Valentine's Day (and Mother's Day) as a mailing event, but I don't know if Month of Letters and InCoWriMo even register with them. I suspect it is a very tiny slice of their market -- though a vocal, active, and essential one! US Global Moon stamps are available for pre-order on USPS.com as of today - hooray!! I got mine ordered. They go on sale Feb 22nd I believe. Considering the seeming scarcity these last few months better get 'em while you can. Thank you for the heads up, Rusty!! Pre-ordering a BUNCH right now!! Thanks from me, too. I ordered three sheets of the Moon! Yes, it's been so crazy not to be able to get any Globals. 2016 is indeed a great year for stamps... thanks for sharing these photos, great inspiration!